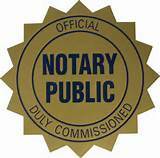 The Oradell Public Library offers notary services for the benefit of the local community. A Library staff member, who is a Notary Public, is offering this service to the community. Notary Services are available on Third Wednesdays of the month 5:00 p. m. - 8:00 p. m. and Tuesdays 10:00 a. m. - 1:00 p. m. Please call the library at (201) 261-2613 to confirm that the notary is in or to request an appointment. Only documents in English will be notarized. All form and documents must be complete before being notarized. Form with blank spaces cannot be notarized. Notary service is not available for power of attorney, mortgage documents, deeds, wills, living wills, living trusts, codicils, depositions or vital records as these types of documents can require specialized knowledge and is beyond the scope of this service. In addition, the notary cannot perform oaths of office. Documents cannot be copied and certified as “true copies.” Please note that certified copies of many documents such as birth, marriage, or death certificates are often available from their original issuing agency. New Jersey law requires that a Notary and the customer seeking notarization be able to communicate directly with each other. Library Notaries are not permitted to make use of a translator to communicate with individuals requesting this service. In accordance with New Jersey Notarial Law, notaries will not provide service if the customer, document or circumstances of the request for notary service raise any issue of authenticity, ambiguity, doubt or uncertainty for the Library or notary. In this event, the library notary may, at his/her sole discretion, decline to provide notary service.